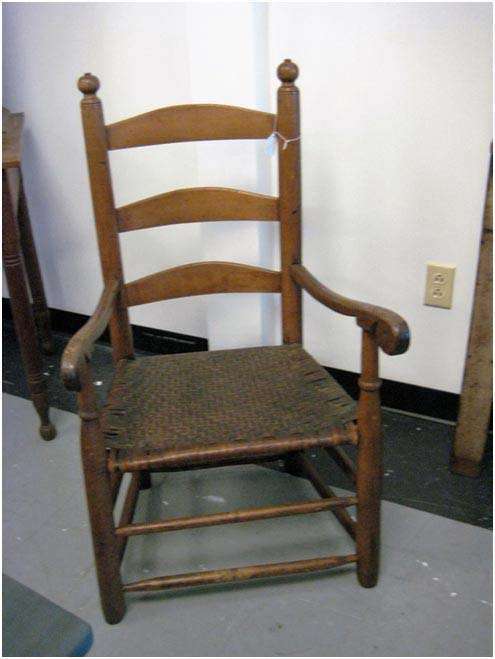 This is a Southern Great Chair, probably from the Dan River Basin and, based on the diameter of the legs being equal from the floor to the seat rails, made in the mid to late 18th century (1760 to 1780). We found this arm chair in New England. The Northern States have always been the best places to find Southern furniture. At the turn of the 19th century and well into the early 20th century, Northern pickers came southward to pay cash for antiques from economically suffering Southerners. The North was way ahead of the South as a collecting community of buyers, having a great deal more expendable money. Further, the first museum to focus on Southern material culture did not even open its doors until 1964. In the North, the first museum opened its doors in 1743 in Philadelphia. A great deal of knowledge has consequently been lost and is still lost about Southern Material provenance. When we first started collecting Southern antiques, we only had about a half-shelf of books about Southern pieces. Now we have several shelves, with several new books published each year. Southern Great Chairs are a special genre. They have greater meaning in the South than the Brewster and Carver Chairs of New England would ever have. The person who sat in this Great Chair had a certain status, such as a leader, a head, a revered one. The man who sat in this chair was the chairman, which is how we got that name. In forty-some years, I have only found a handful. While I currently have three, there is no more room for another. More examples of Southern Great Chairs can be seen on pages 52 through 71 of Hurst and Prown’s 1997 classic reference book, Southern Furniture: 1680-1830. Yet even more can also be seen on pages 116 through 121 in John Bivin’s The Furniture of Coastal North Carolina: 1700-1820. Both of these books are required reading for collectors of all things Southern and need to be on their bookshelves.